If you guessed Smells Like Teen Spirit by Nirvana, great job. Yeah, grunge isn’t really my thing. It’s Dad-Rock Tuesday, though, and what the padre says goes. I’ll admit, they do have the nostalgia factor going for them. Weird Al’s Smells Like Nirvana as well as In Bloom on Rock Band were pretty big parts of my youth. It’s hard for me to relentlessly trash this record. I’m going to anyway, though. Actually, I’ll let the aforementioned Weird Al track do the talking for me—I’m just that lazy. “Well, I’m yellin’ and we’re playin’ / But I don’t know what I’m sayin’ / What’s the message I’m conveyin’? / Can you tell me what I’m sayin’?” Pure comedy gold right there. As a matter of fact, no, I cannot tell what Kurt Cobain is saying. That’s a problem with a lot of stuff on Nevermind. I’m all for strange voices and emotional lyrics, but I best be able to understand that ish. I guess this all loops back to my dislike of grunge music. I can’t possibly be expected to enjoy what is considered the epitome of that subgenre. It’s not that it’s too angry as music; anger can be good. I just feel that this anger is all misguided, mainly because I have no idea what it’s guided at. Because I can’t understand the lyrics. Because it’s grunge. Circular effing reasoning. 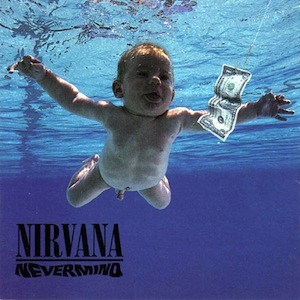 Also, while I’m on the topic of things discussed at writing camp, why is this record called Nevermind? It’s not a compound word, bros.
You raise an interesting issue (to me at least): how important is understanding lyrics to the appreciation of the song? Frank Sinatra went batshit over the rock’n’rollers not enunciating. In fairness to the Chairman, you can clearly understand pretty much every word he sings. His ability to enunciate while singing is prodigious. I have a lot of trouble picking out lyrics on a lot of music – especially if there are drums. A lot of the time, I have to look up lyrics online if I am motivated to do so. I listen to a fair bit of Brazilian music. I don’t speak Portuguese. That does not stop me from enjoying the music a lot though I may very well be missing a dimension. You liked Fear of Music by Talking Heads. How did you like I Zimbra, the “song” with nonsense lyrics by the surrealist poet Hugo Ball? Did the fact that the lyrics were jibberish detract from you enjoyment and appreciation?